The EDview project is a collaboration between EDLAB and the Department of Educational Development and Research (FHML). EDview is a one-year long research project that aims to include all actors at UM to create a vision on how to proceed with the education at UM in the future. Are we ready for the next 40 years? If not, what do we need to do? EDview’s results are now available for download! EDview delivered a Position Paper that describes a shared view on the future of education at UM, specifically the role of PBL. The paper includes an Executive Summary. 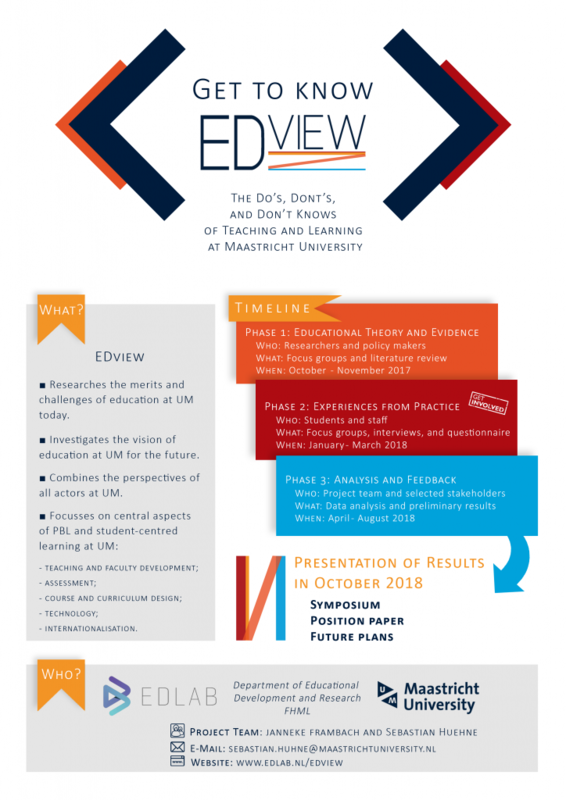 Furthermore, EDview put together a comprehensive overview of Do’s, Don’ts and Don’t Knows that follow from the Position Paper, ranging from the areas of teaching and designing education to marketing and communication, leadership and human resources. Details on EDview’s research approach and methods, acknowledgements, and an overview of the EDview Project Team are included in EDview’s Appendices.